Proper electrical installations are a crucial part of any construction or remodeling effort — whether that's in the home, a commercial setting or a large industrial complex. 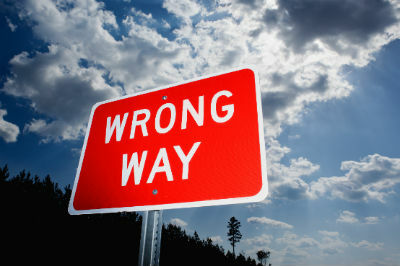 However, it's not hard to find instances where shortcuts have been taken that violate electrical codes and safety. 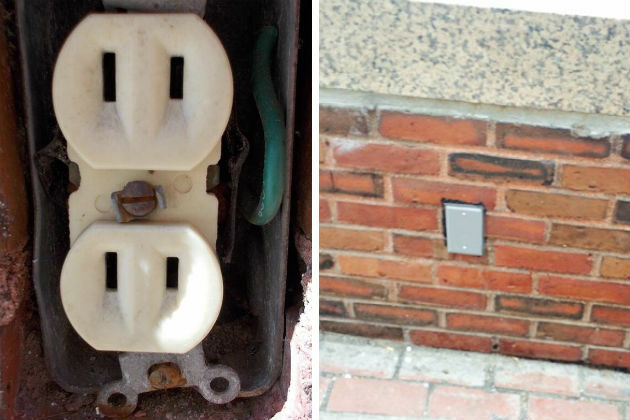 This old ungrounded two-wire receptacle (left) had a missing cover and exposed live 120-volt wires. It was being used by homeless people outdoors in front of City Hall to charge their cellphones or play a boombox. 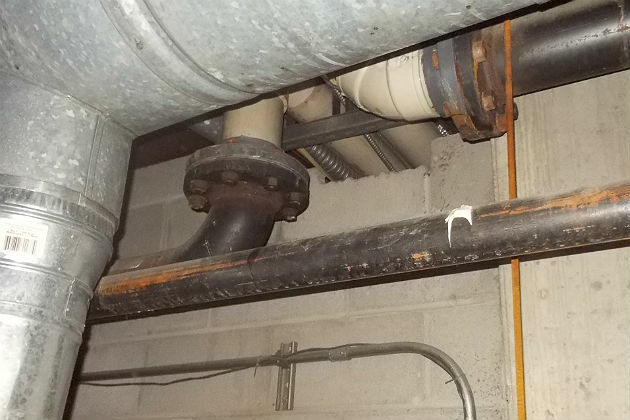 When reported to the property managers, it was removed quickly and a blank cover was installed as shown (right). When located outside of buildings, the present safety standards require properly-grounded receptacles, special in-use covers and GFCIs. Take a look around your buildings, and if you find any electrical safety hazards, contact a licensed electrician, local electrical inspector or fire marshal and report it right away. Electrical installations in hollow spaces, vertical shafts and ventilation or air-handling ducts are required to be made so that the possible spread of fire or products of combustion will not be substantially increased. Openings around electrical penetrations into or through fire-resistant-rated walls, partitions, floors or ceilings are required to be fire-stopped using approved methods that will maintain the fire-resistance rating. Informational note: Directories of electrical construction materials published by qualified testing laboratories contain many listing installation restrictions necessary to maintain the fire-resistance rating of assemblies where penetrations or openings are made. Building codes also contain restrictions on membrane penetrations on opposite sides of a fire resistance-rated wall assembly. An example is the 600-mm (24-inch) minimum horizontal separation that usually applies between boxes installed on opposite sides of the wall. Assistance in complying with 300.21 can be found in building codes, fire resistance directories and product listings. See the 2014 NEC Sections 300.21, 725.3(B), 760.3(A), 770.26, 800.26, 820.26, 830.26. 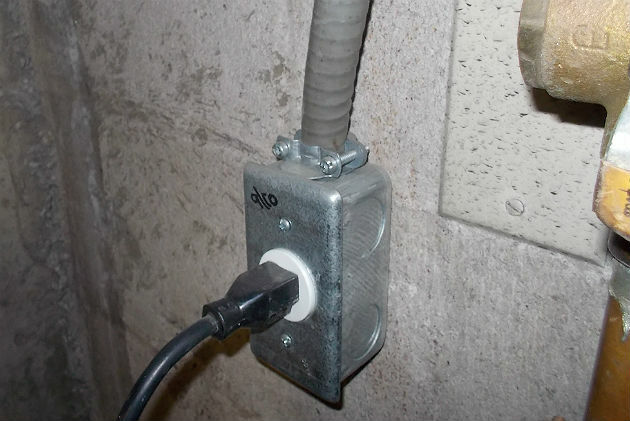 The liquid-tight flexible metal conduit that was installed into this handy box enclosed a branch circuit to supply a receptacle, and it was secured with a connector designed for a cable assembly. Its important to remember that listed or labeled equipment is required to be installed and used in accordance with any instructions included in the listing or labeling. Fittings and connectors are required to be used only with the specific wiring methods for which they are designed and listed. See the 2014 NEC Sections 110.3(B) and 300.15. Joe Tedesco was a director and senior electrical code instructor for National Technology Transfer, Inc. and American Trainco, Inc. He developed and presented NEC, grounding and bonding, and building electrical inspection seminars. Joe presented over 300 on site seminars for major corporations, and he was the codes, standards and seminar specialist for the International Association of Electrical Inspectors.